Overdrive: Have breakfast at Goodwood! This press release arrived just as I was starting to think about Breakfast... Brilliant timing! Porsche, Alfa Romeo, Ferrari, Audi, Lamborghini, and a few things we can't see clearly. What a line up! Now often copied, but rarely bettered, the ‘original’ admission-free Breakfast Club meeting at the Goodwood Motor Circuit enters its sixth season for 2012 with the tempting promise of an eclectic mix of vehicles and a tasty breakfast menu to whet the appetite of any motoring enthusiast. 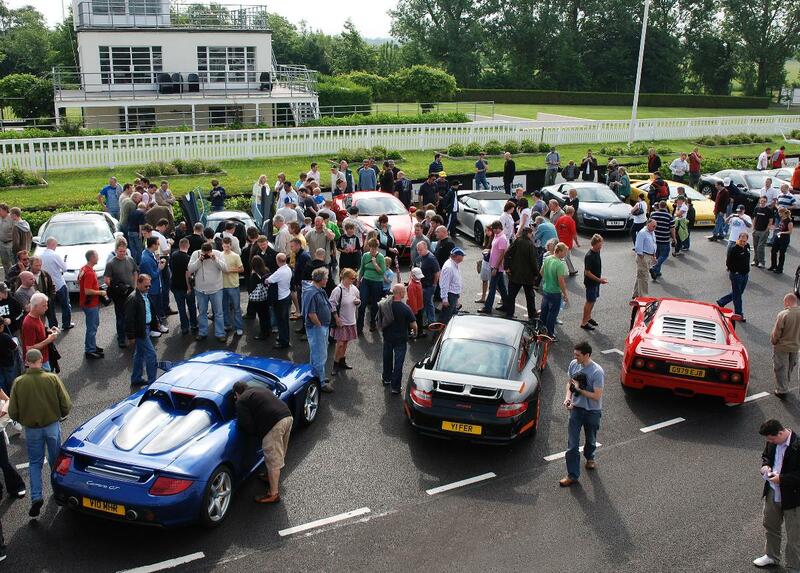 The Goodwood Breakfast Club remains free to all visitors. It is now firmly established as a ‘must attend’ event for thousands of car and motorcycle connoisseurs who appreciate an enjoyable Sunday morning drive through the quiet West Sussex country roads down to Goodwood, where they are able to meet like-minded enthusiasts, admire some fabulous machinery and eat a tasty breakfast, before heading back home in time for the Sunday roast, to do a spot of gardening and DIY, or simply put their feet up and watch the Grand Prix! For the 2012 season, Goodwood has devised a range of Breakfast Club themes to cater for all enthusiasts and vehicle types. As well as popular familiar themes, this year sees some new themes to reflect important celebrations and anniversaries taking place in 2012. These include an-all British vehicle theme to celebrate HRH The Queen’s Diamond Jubilee, to be held on the Sunday of the long Bank Holiday weekend on early June. 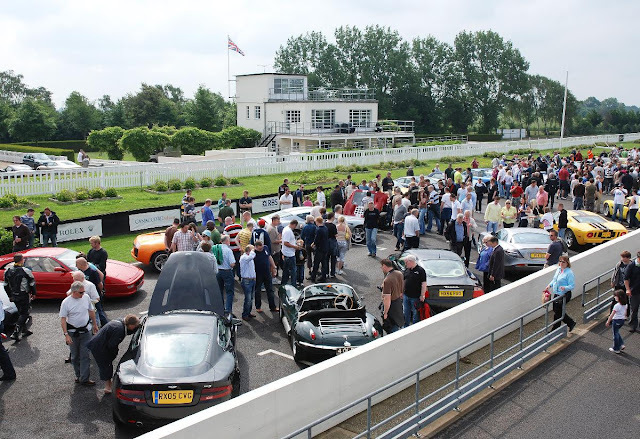 The 50th anniversaries of many iconic cars - from the popular Triumph Spitfire and MGB, through to the authentic and desirable AC Cobra and Ferrari 250 GTO, will be marked with a pre-Revival Thoroughbred Sunday meeting on 5th August. It just gets better... Ferrari, Aston Martin, Lamborghini, Jaguar (a rare one too), Maserati, Mercedes, Ford GT... Why wouldn't you want to be there? As in previous years, the Breakfast Club meetings will be held on the first Sunday of the month at the historic Goodwood Motor Circuit, with the exception of July and September, when the popular Festival of Speed (28 June-1 July) and Goodwood Revival (14-16 September) motor sport events will be held. Visitors are encouraged to pre-register their vehicles by e-mailing the dedicated Breakfast Club team at cooked@goodwood.com. The dedicated Goodwood Breakfast Club website has updates on each monthly theme, and enables visitors to pre-register online at (www.goodwood.com/breakfastclub). A full list of the 2012 Goodwood Breakfast Club dates and themes follows. Bikes, trucks, tractors, vans, aircraft..., anything with an engine except a regular passenger car - nothing is too bizarre, and very apt for April Fool’s Day! Celebrating the golden era of Goodwood Motor Circuit with pre-1966 classics, with a special emphasis on cars that celebrate their 50th anniversary in 2012, including the Ferrari 250 GTO, AC Cobra, Lotus Elan, MGB, Triumph Spitfire, Rover 2000, etc. Open top cars of all shapes and sizes, to catch the last sunshine of the year! All 2012 Goodwood Breakfast Club events will be staged from 08.00 to 12.00 hours on the first Sunday of the month (except July and September, due to the proximity of major Goodwood motor sport events). Honda in March, an Aston Martin for May, a Jaguar for June, and a Caterham for October... Who likes this idea?